India 2009 "Stampmania: Balasinor Dinosaur Fossil park"
All philately exhibitions brings special covers, booklets and other postal stationary with them. 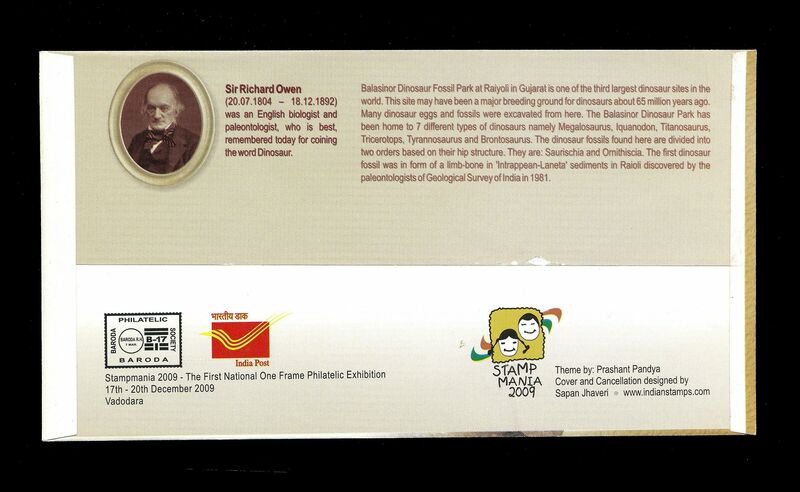 Any philately exhibition is incomplete without special issues. 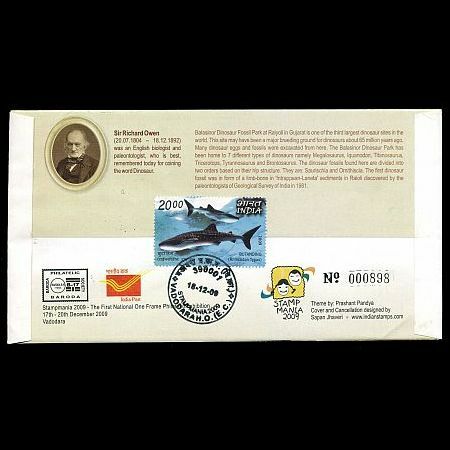 During Stampmania 2009 a souvenir, a carried cover and four special covers, one for each day, were issued. 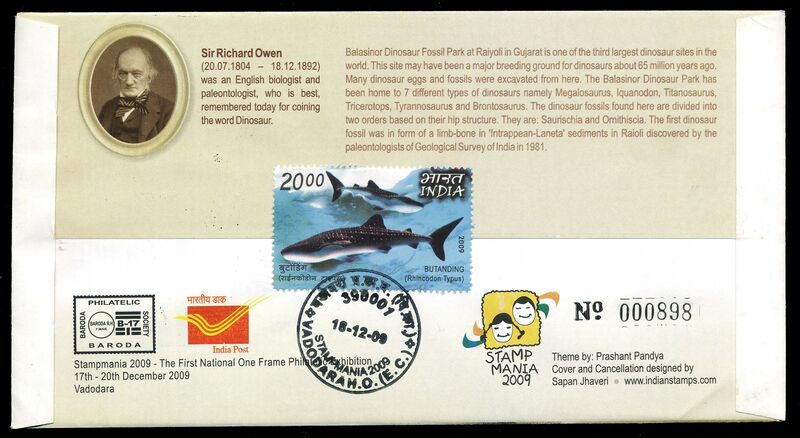 One of these covers is dedicatd to Balasinor Dinosaur Fossil park at Raiyoli in Gujarat - one of the third largest Dinosaur sites in the world. This site may have been a major breeding ground for dinosaurs about 65 millions years ago. Many dinosaur eggs and fossils were excavated from here. The Balanasinor Dinosaur Park has been home to 7 different types of dinosaurs namely Megalosurus, Iguanodon, Titanosaurus, Triceratops, Tyrannosaurus and Brontosaurus. The dinosaur fossils found here are divided into two orders based on their hip structure. They are Saurischia and Ornithiscia. 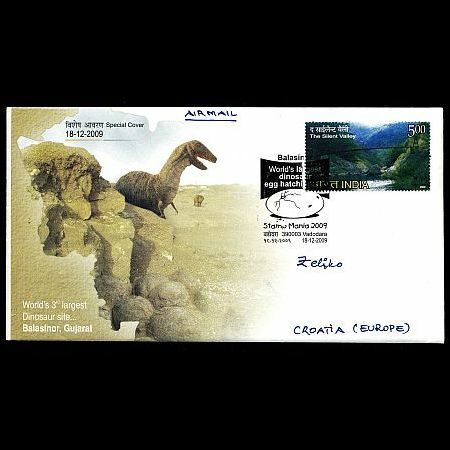 The first dinosaur fossil was in form of a limb-bone in "Intrappean-Laneta" sediments in Raioli discovered by the paleontologists of Geologicval Survey of India in 1981. In the early 1980s, palaeontologists stumbled upon dinosaur bones and fossils during a regular geological survey of this mineral-rich area. The find sent ripples of excitement through neighbouring villages and many residents picked up fossilised eggs, brought them home and worshipped them. Since then excavations have thrown up a veritable trove of dinosaur remainseggs, bones, a skeleton which is now kept in a Calcutta (Kolkata) museumbringing hordes of scientists and tourists to Balasinor.